You’ve seen them — those glorious bath bombs that turn a boring bath into a blissful retreat. Available in every scent you can imagine, there’s one or more for everyone. But while lounging in a bath with a bath bomb is wonderful, paying $5 per soak is not. Of the five ingredients that you’ll need for this project, none is exotic or difficult to find. You probably have most of them in your cabinet already, just waiting for your bath bomb project. And making them couldn’t be easier. Here’s how to make your own bath bombs at home just for a fraction of the cost you’d spend at the store. * I found citric acid at my local health food store. 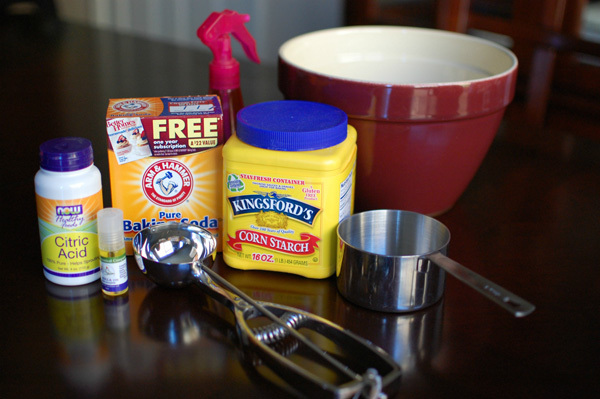 Sift 1-3/4 cup baking soda, 1 cup citric acid and 2 cups cornstarch into a glass bowl to remove any clumps. Be sure to mix thoroughly with your whisk to evenly distribute all of the ingredients. Pour half of the powdered mixture into another glass bowl. Lightly mist the powder with your colored water in the spray bottle, stirring thoroughly after ever spritz. If you add the water too quickly, the mixture will begin to fizz. Keep checking the mixture until it can be tightly packed and shaped. This will take a while, but it’s important that you stop adding water before it gets too wet. Once your mixture has reached the desired consistency, add 3 to 5 drops of essential oil and mix well. 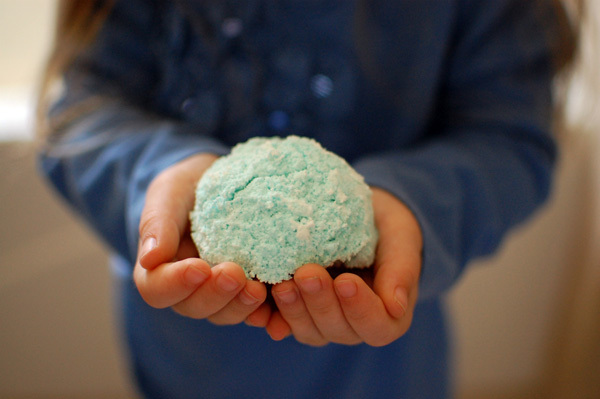 We used vanilla oil, and 3 drops made for a lovely and subtle-smelling bath bomb. Firmly pack the mixture into your scoop or silicone molds and allow to harden for 3 hours. (We used a half-cup scoop, which was perfect for our large tub.) If using a scoop, place the bath bombs on a cutting board and allow to harden. If using molds, be sure to remove the bath bombs carefully, as they crumble fairly easily. 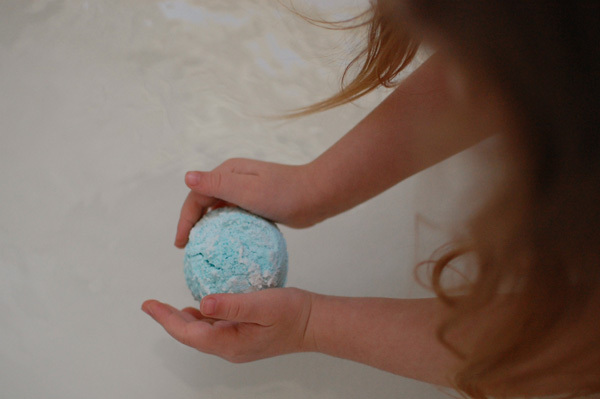 Though these bath bombs are fun for kids, they can make the bottom of the tub a bit slippery for a few minutes.